Did you purchase your phone from Saudi Arabia, Dubai, Bahrain, Qatar or any other country? Is your phone manufacturer is Samsung and supports VoLTE but not working when you put in the Jio Sim Card? Well, it’s mostly because of the different country firmware installed in your Samsung’s Smartphone because you might have bought it from the different country! Note: This guide will require you to wipe all the phones data and restore it to factory settings. Please backup before you proceed. I’m not responsible for bricking your device. Proceed carefully step by step! As all of us now know about the Reliance Jio in the Indian market. It spread like hot pancakes in a short period of time because of it’s free service. Unlimited Calls, Unlimited Data, and Unlimited SMS. Now, the free period has already gone. The prime members are allowed that same kind of free service as before but with plans. The most popular plan is RS 309 before RS 303 in which you get Unlimited calls, Unlimited Data (FUP applies after using 1GB/Day). It still worth paying 309 for their plans! You get much more than expected. New Plans introduced as of this Christmas 2017. Rs 199 & rs 299 are introduced with more Data Limit. Another plan for Rs 459 & Rs 499 introduced with 84 days & 91 days respectively. You get same 1Gb/Day. So, enough bragging about Jio. Let’s move on to our main topic. This topic is being discussed in whole India and had literally very less solution available online. Therefore, I decided to write this post on my blog with complete information. As India is developing country and obviously many people come and visit India from different countries. Many people shift back to India after working in different countries. They all have smartphone belonging to that country. How to Fix VoLTE on Samsung Devices bought from different countries in India? If you don’t know if your smartphone is supported or not then check it here. Recently, I bought the new Samsung Galaxy J5 Prime which took away my heart at first launch itself. I bought this device from Saudi Arabia. In your case, it might be any device such as S7, S7 Edge, S6, S6 Edge, S5, J7, J5, J5 Prime, J7 Prime, J5 (2016), J7 (2016) and many other devices which are listed on Jio’s official page for VoLTE enabled devices. Important Notice: In this post, I’m going to change the CSC (Country you purchased the phone from) of the device to the CSC (INS,INU) India. In my case, I bought the device from Saudi Arabia, therefore, it has a CSC as KSA. I’m going to change it to INS or INU by flashing the Indian firmware. Disclaimer: Again a warning! I’m not responsible for bricking your device. Please follow the steps carefully and properly step by step and it works perfectly. Go to SamMobile. 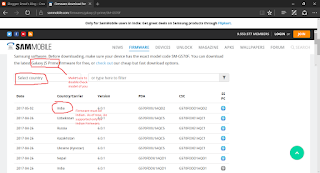 Type in your device name and search for Firmware of your device. Make sure that firmware belongs to INDIA. Download Samsung Odin 3.12.1 and extract it to your desktop. Now, extract the firmware you downloaded in step 1 into the Odin folder on the desktop to make the task much easier. Open Odin and tick BL then click on BL to select BL firmware from the firmware you extracted in step 3. Do the same for rest three that is AP, CP, and CSC. Don’t get confused between two CSC files in the firmware folder. Choose the file starting with CSC only and leave HOME_CSC as it is. Now, switch off your device. Press Volume Down Button + Home Button + Power Button simultaneously to boot the phone into Download mode. Now, Odin will detect your device. Go to Options Tab, and check Re-Partition. Now, press starts to flash your device. After Odin pass flashing the device successfully, let your device boot till welcome screen. When the device successfully boots to the setup screen. This step is necessary or else VoLTE doesn’t work, even though you set it up. Switch off the device using the power button. Press Volume Up Button + Home Button + Power Button at the same time to boot the phone into recovery mode. You should now be able to see No Command. Press the same combination again once. In recovery, Wipe cache and Wipe Data/Factory reset. You can also do the above steps if you have forgotten and set the device already! Phew, your device is now successfully flashed to INDIAN CSC. You now able to get updates and enjoy VoLTE using your Jio Sim card. Pop in the sim and it should say VoLTE at the top within a few seconds. Thanks for reading. Hope it help. The links in this post contain only single ad and you should skip it to download Odin. 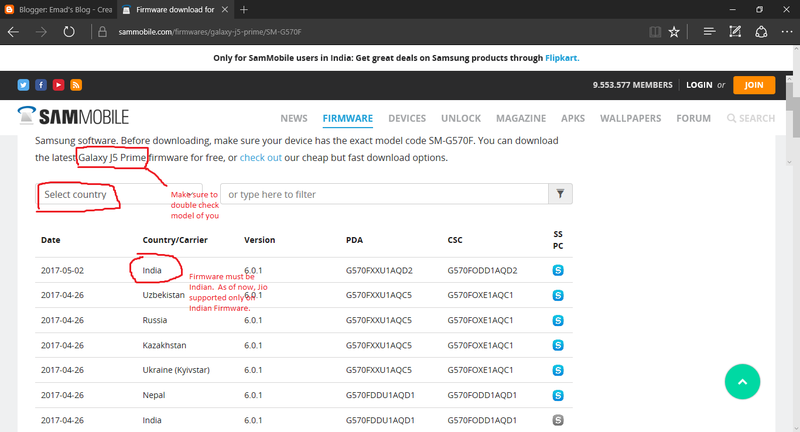 Yes, there is specific INS firmware for every device model. Check your model and flash accordingly else it may brick your device. We're not responsible for it. Do it at your own risk! Can you also tell how to get the sim unlock key for india for the samsung galaxy J7 Prime which was bought in Saudi Arabia.